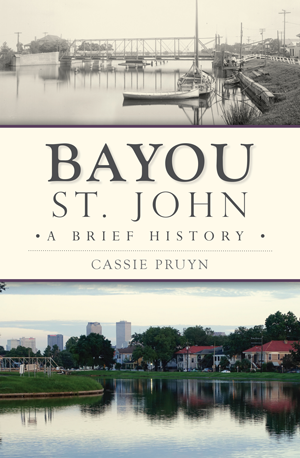 Bayou St. john played a significant role in the neighborhood of the same name, fueling debate over the waterway's use, control and ownership for centuries. Native Americans first used it as a trade route. Later, it became a backdoor entrance for settlers to the present-day French Quarter. As commercial use declined, residents witnessed a progressive shift toward recreation. Following the Civil War, tourists flocked to witness Marie Laveau's voodoo ceremonies. The early twentieth century brought two amusement parks. And events like the Bayou Boogaloo music festival draw thousands of visitors. Despite its many costume changes, the bayou continues to be the Crescent City's most beloved waterway. Author Cassie Pruyn reveals this evolving story. Cassie Pruyn is a New Orleans–based writer and researcher, born and raised in Portland, Maine. She is the author of Lena, winner of the Walt McDonald First-Book Prize in Poetry (Texas Tech University Press 2017). Her poems, reviews and essays have appeared in numerous publications. To read more of her work, including her blog about Bayou St. John, visit her website at cassiepruyn.com.